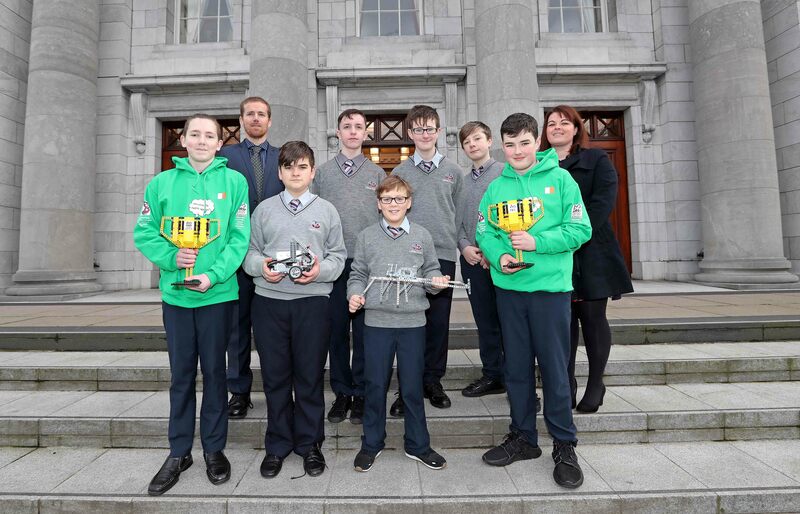 For the second consecutive year, a team of budding coders and robotic technicians from Cork Education and Training Board’s Coláiste Daibhéid will eagerly travel to Bristol to compete for the chance to be crowned champions of the Institution of Engineering and Technology’s (IET) FIRST LEGO League UK and Ireland. This talented young group, comprised of four first-year students and three second-year students, along with their coach, Principal Tadhg Ó Laighin, are in the final stages of preparation for this final battle which is taking place on the on the 16th of February. and are hoping to take that ‘Giant Leap’ which will help them reach the World Championships in Detroit. In order to prepare for the upcoming competition, the innovative young students attended a series of weekend workshops in UCC organised by Learn-it and the School of Engineering UCC. Following success in the Munster Finals in UCC at the start of December last year, the focus has now turned to Bristol. Their success to date has been all the more amazing as their presentations and robotic games were all as Gaeilge. First Lego League UK and Ireland (FLL) is a world-wide robotics competition aimed at 9-16-year-olds and challenges teams to build a robot to tackle a series of missions and create an innovative solution to a real-world problem. This year’s INTO ORBITSM challenge is all about space; how humans survive for extended periods in this unique environment. The event, which originated in America, now has over 40,000 teams participating from 98 countries around the world. The successful winning team from the Bristol Open will go forward to the World Championships which will be held in Detroit in April. Last year the students from Coláiste Daibhéid qualified for the European Open in Debrecen, Hungary, where they came away with a very respectable Third Prize. Building on the success of last year, these Cork students are hoping to go all the way and secure their spot at the World Championships in Detroit. For the upcoming UK & Ireland final, the Coláiste Daibhéid team, known as C.D. Imreoirí, researched and designed a solution to deal with the physical deterioration of the body in the microgravity environment of a space shuttle. They have designed clothing that will, through micro vibrations, cause the muscles and nerves to remain active. Last week they met with Dave Gibbons, Finbarr Waldron, Alida Zauer and Prof Cian Ó Cíobháin from the European Space Agency in the Tyndall Institute. This allowed the students to get real expert feedback on their new clothing technology. Team Coach and School Principal, Tadhg Ó Laighin commented, ‘This our second year in a row representing Ireland in this world-renowned robotics and coding competition. The challenges are getting harder but our talented team of seven have already shown remarkable determination and skill-levels to earn their place at this international competition. Táimid ag súil le barr feabhais a bhaint amach’. Mandy Workman, FIRST® LEGO® League IET Education Manager, commented in relation to this competition, “FIRST® LEGO® League allows young people to experience engineering in action. As well as bringing excitement to STEM (Science, Technology, Engineering and Mathematics) subjects, the students get hands-on experience with robotics and designing innovative solutions to real-world problems. Developing computer programming, teamwork, problem-solving and communications skills has never been so much fun, and this platform gives students an insight into the creative and innovative careers that engineering presents. The event will be the largest ever IET FIRST LEGO League UK and Ireland Final with over 500 young people attending who will all be keen to demonstrate their skills in robotics, computer programming, teamwork, research, problem solving and communication. The IET (Institute of Engineering and Technology) is proud to be the operational partner for IET FIRST LEGO League in the UK and Ireland. Supporting the competition is part of the IET’s commitment to show young people the benefits of careers within STEM. For more information about this year’s FIRST LEGO League competition, visit http://firstlegoleague.theiet.org/index.cfm. For updates and images from the FLL event or to find out how your school can get involved next year, visit the website www.colaistedaibheid.ie or follow Coláiste Daibhéid on Twitter @CDaibhead.